It’s a photopolymerization process that uses UV energy source (the Ultra-Violet light) to transform a liquid into a solid. With the absorption of the UV energy, the photoinitators contained in varnish, ink, adhesive or resin in the liquid state produce substances called free radicals, that react with the chemical compounds of the liquid substance, turning it into solid. This process is also called “polymerization”. In the traditional UV curing process, for many years quartz discharge lamps have been used, they contain mercury and sometimes other substances, called halides. These improve the UV emission at certain frequencies (nm) where photoinitiators reacts better. The beginning of the third millennium marked a technological change of light sources commonly used in visible lighting (home, public and industrial sectors) and in the UV light. LED is the innovation, an electronic component also called diode, made by a p-n junction created in a semiconductor material. By Applying a certain electric current at its ends in forward direction, the junction emits radiation in the visible light range, infrared or UV according to the type of semiconductor material used. 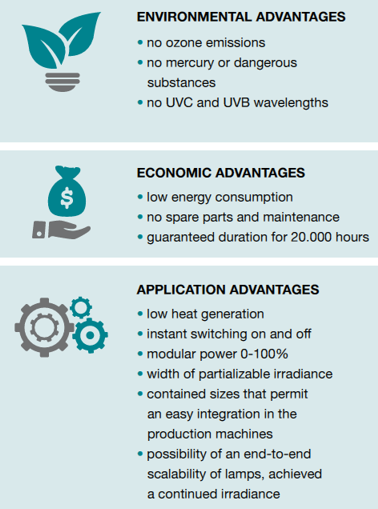 Among the sources of the UV light, UV LED are definitely the innovation of the future, offering many advantages in curing and drying industrial processes. The production of LED UV systems is a complex process because it involves a very high know-how in micro electronics, optics and thermodynamics, to get technologically advanced results and high quality and efficiency products. Photo Electronics for many years has been investing resources in this field and today offers the complete range of DROLED UV LED lamps with excellent characteristics and expected long life, among all the lamps currently available on the market. How is made an UV Led lamp ? 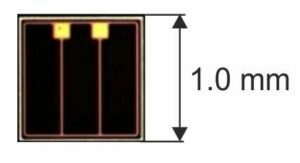 A Led semiconductor is usually a small area (less than 2mm side) light source with limited power, so many of them are necessary to get enough UV light. Photo Electronics uses custom made COB (chip on board) Led solution. With this sophisticated technology, LEDs arranged in high density matrix allow to reach high UV intensities (w/cm²) with compact design. The UV power generated reaches the necessary level for curing paints, inks and other products with UV photoinitiators. COBs LED are driven by electronic circuits, which allow a fine power control from 0 to 100% and are cooled by an electronically controlled ventilation system. Special additional optics guarantee the maintenance of a high value of the emitted radiation, even at different distances from the surfaces to be cured, thus further improving the efficiency of the UV Led system. COB technology allows to get a flexible UV Led lamp with modular architecture, to meet specific customer needs.